Hello music video programming cohorts, it’s Andy Gesner and the staff from HIP Video Promo, back with another stunning clip from a new artist destined to become one of the musical stories of 2007. In the U.K., Natasha Khan – better known as Bat For Lashes – has already made quite a mark. Fur & Gold, the debut, has won the project some high-profile admirers (including Devendra Banhart and Radiohead’s Thom Yorke), and a Mercury Prize nomination for the year’s best album. The NME has called her music “beautiful and haunting”, and likened it to “Bjork stranded on a stormy moor”;Interview Magazine praised the young singer’s “spellbinding” voice and songs. The live Bat For Lashes experience has earned its share of acclaim, too: Khan and her quartet animate the material from Fur & Gold through creative arrangements and quietly passionate performances. Bjork herself was so impressed by Khan that she personally requested the band as an opening act at her Rock En Seine Festival; Jarvis Cocker did the Icelandic superstar one better by grabbing Bat For Lashes as the support act on his ’07 tour. While often compared to Kate Bush, Siouxsie Sioux, and Tori Amos, Natasha Khan has developed an identity and sonic vocabulary of her own. Her music, while immediately familiar, is also elusive, multifaceted, impossible to pin down. Nevertheless, one word that continues to appear in reviews of Bat For Lashes is “spooky”, and it’s a good descriptor: Khan herself has likened the feel of her music to “Halloween as a child”, and she’s appeared onstage dressed as a skeleton. Part of the ghostliness of Fur & Goldradiates from Khan’s ethereal – but edgy – vocals. Her voice is a supple instrument; she can howl and purr, address the listener conversationally, sound like a frightened child or a terrifying adult, and switch between modes with startling precision. “What’s A Girl To Do?”, the first American single from Bat For Lashes, starts with a near-spoken verse over a Phil Spector beat, and then slips into an anguished, howling chorus. It’s a chilling ride, hypnotic and engrossing, and it announces Natasha Khan’s arrival as a nascent master of cinematic song. Director Dougal Wilson is no stranger to strange, spectral music – he’s shot videos for LCD Soundsystem, Hard-Fi, and The Streets, and he was behind the camera for the creepy late-night taxi drive that accompanied Jarvis Cocker’s “Don’t Let Him Waste Your Time”. But with the unsettling clip for “What’s A Girl To Do?”, he’s outdone himself: it’s one of the best clips we’ve seen all year, and it’s sure to be the talk of YouTube and other video-sharing sites. Looking lovely – and perhaps a little dreamy – in a blue pajama-top and silver tights, Natasha Khan guides a child’s bicycle down a deserted highway at night. She rides, unswerving, in the middle of the road, and sings as she does; behind her, trees angle toward the center of the street, forming a dark canopy over her head. Light flashes off the bicycle handlebars and reflectors, the clip in Khan’s hair, and the sparkles on her shirt. But when “What’s A Girl To Do?” reaches its chorus, the action really begins: a chorus-line of BMX bike riders suddenly appear behind her. Wearing giant, grim animal masks, they clap along with the song and perform stunts in tight formation. The incongruity of the masked riders only add to the chill – as do the images of trick-or-treaters lost in the woods, abandoned and upturned automobiles, and Khan’s own breath, condensing in clouds beside her. Here at HIP, we’re elated to be working for the first time with Sarah Wefald at Caroline Records to go to bat for this deserving artist. Our pals at Caroline have been kind enough to hook us up with copies of the Fur & Gold CD, so if you’d like to set up an on air giveaway or contest featuring Bat For Lashes, please drop us a line! If you need more info, call Andy Gesner at 732-613-1779 or e-mail us at HIPVideo@aol.com. 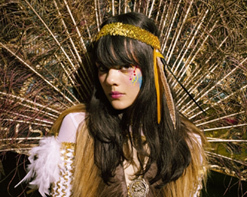 You can also visit www.Caroline.com, or www.BatForLashes.com to find out more about Bat For Lashes.